It is now 10 years since we have been running our 100% satisfaction guarantee. I don't know whether to be thanking you guys for never complaining or my staff for a stand up job. I don't want to sound smug (Though I am pleased with my team). I really want to know if there is anything you think we could better. By listening to you we are kept on our toes and never get complacent. The long story short is the only complaints we ever have are about postal services from around the world, and that isn't down to us. I might be tempting fate but please let us know what we could do better? I am sorry to disappoint you Roderick but the only complaint I can think of is that a few of your snuffs I don't like (I still think they're good and would recommend them to someone with different taste then me) but I really can't think of anything to harp on. Good feed back prompt service and aces when it comes to packaging the product as close to perfect as possible. Another satisfied customer. Think I've steered at least two people to place orders with you just based on my positive experience. And that's just after 1.5 months or so of snufftaking. I only have good things to say about Toque. The variety and quality is a pleasure to depend upon. At some future point, I would like to see a few snuffs with a coarser grain and more moisture. It would also be great to see more limited editions- new flavors or perhaps existing ones in double the strength. The only problem I've ever had has been cross contamination of certain snuffs during transit,d I think the only remedy is to order them separately. OT: Roderick, any update on when you can make Whisky honey USA again? Well, I have a big problem with Toque..well, actually, it's just not toque, but several manufacturers. I place orders based on reviews and curiosity, so if a snuff looks interesting and it has good reviews, I'm ordering. Here's the problem though: Within a few weeks of ordering, the tins appear to be empty?!? I'm not sure what happens, but I think your snuff is self-destructing or evaporating, cause there's no way I'm snuffing that much! If you can fix that issue, I'll be forever in your debt. 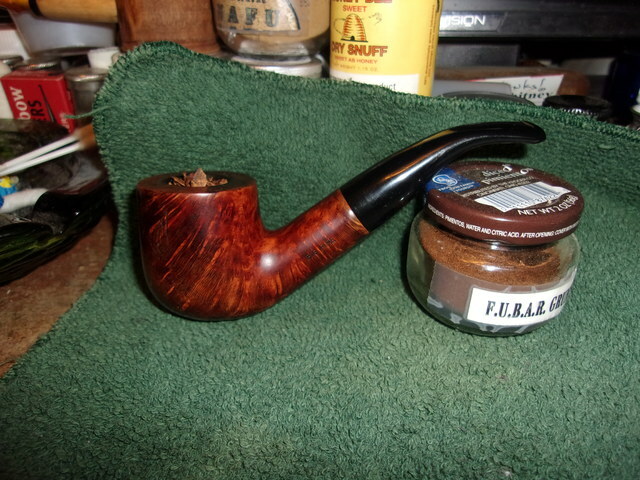 On another note, with a real "complaint" the tins don't keep the snuff fresh for long. On the genuine complaint. This I do agree with. I am also very proud of this. It is down to my insisting we use 100% natural flavouring. Grapefruit is one of my favourites yet it loses its flavour a week after the tin is opened. At the other end Absinthe will not only keep it's scent for years, it will cross contaminate any tin it is packed with. We even tried putting the tins in grip sealed bags but for some strange reason it made it worse. I'm sorry to say, I don't intend to do anything about this and swear here and now you will never find a Banana (flavour can only be made synthetically) snuff in any range we make. @Roderick I see, explains a lot. I found your snuffs to absorb new moisture quickly though, found that out an hour ago. Keep the good snuffs up. Here is one type jar I use that origanly contained diced pimientos from grocery store in which I never throw away LOL. This is just a 2 ounce jar which is ideal for snuff. I also would like more coarse grinds. Coltsfoot is one of my all time favorites. Quote: " Grapefruit is one of my favourites yet it loses its flavour a week after the tin is opened." Is that why we can't buy Grapefruit in bulk? I have never shoved 25g up my nose so quickly. It's a fantastic snuff!! That, and as we use 100 percent natural flavouring it goes into secondary fermentation if kept in a bag for any length of time. Have you ever seen a forgotten OJ carton explode. @Roderick, I would like to see just one thing from toque. More of an aggressive social media campaign and online presence. I would love for toque and nasal snuff to be more mainstream then it is. I think the way to get snuff more mainstream is just to follow the old school rules of etiquette. What do I mean offer the snuffbox around. Hell I'll even sometimes buy an abomination like chocolate scented snuff (if I know I am going to be around enough ladies). It's got to get somewhat normalized before it gets more mainstream, well if that makes sense. the Dholakia swiss chocolate is pretty great for sharing. It's like having a chocolate cake living in your nose. Just placed my first order and am very excited. Been hard to find around here and you guys have some great prices.